The Devil and Tom Walker research papers examine the short story written by American author Washington Irving. “The Devil and Tom Walker” opens with the story of Kidd the Pirate, who makes a deal with the devil in order to keep hidden his treasure, which he buried in a Massachusetts forest. Kidd dies before he can retrieve his treasure, but the devil continued to protect it. 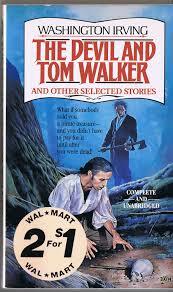 Jumping forward to the year 1727, Irving introduces Tom Walker, a greedy and selfish man with an equally greedy wife. One day, Tom Walker comes across an old Indian forest, and falls into conversation with the devil, known as Old Scratch. The devil offers Tom Kidd’s treasure in exchange for his soul. Paper Masters writes custom research papers on The Devil and Tom Walker and examine the short story written by American author Washington Irving.